This entry was posted on Tuesday, October 31st, 2017 at 6:15 pm	and is filed under Borderlands 2. You can follow any responses to this entry through the RSS 2.0 feed. You can leave a response, or trackback from your own site. That’s entirely reliant on tools being made to decrypt and encrypt currentgen console saves. Well PS4 Save Wizard now exists. Have you looked into it Rick? trying t download borderlands tps and borderlands 2 save editor on another computer but it’s not alowing me to view the download page. ANy suggestions? I have gin, horizon, etc but I’m having a issue. When I download my profile from horizon to my dashboard then open gib and look for it, it’s not in my dashboard. But when I open my files it shows it is. I have no idea how to fix this. Please help. I really want to be able to use Gib in Borderlands 3 to know Gib has a future. As well I don’t have a ps3 or xbox 360 so I really want Gib to update with the times. How do you get the save file on the nvidia shield? Can’t you just get to the files? Does it have an SD card?, try to connect it to the PC in anyway to see the file system. how comewhen i save the character to the bl2 save folder, the character doesn’t show up in the game? i cant get the save editor to work, every time i load a save up it gives me a reencode mismatch error, but it will allow me to create a new save. what is happening? Reencode mismatch means there was data loss when verifying your save. If you’re absolutely sure you’re running the latest release of the save editor, and using the correct save editor for the game save you’re opening, please post a sample of your save file. Hey, how do you run the save editor? I can’t find any .exe or anything and the readme don’t mention it. How do i find my saved games? When ever i look up how to do it on YouTube they tell me to check the willow games folder but all that i see in there are folders called “Config” “CookedPCConsole” ‘Localization” “Movies” and “splash”. I looked through those and cant seem to fine anything. The only reason that wouldn’t work is if they added entirely new items. It might be inaccurate with suggesting items might be deleted but it should work. hey im getting that reencode mismach error too im running the latest editor version and im running the latest game update as well and i know my save is good im using the right save and running off the correct platform as well but it still won’t work. can i get a hand? Upload a sample of the save file not working somewhere and link it. any good places you know to upload it? Any file sharing site should be sufficient. Mediafire, Mega, Mediafire, etc. Your save is loading fine here. Please ensure you’re using the latest version of the save editor. Is there a better way to increase mission/region difficulty in borderlands 2? I have tried to modify the level on MissionPlaythroughData objects that are active, and also increasing the level on the RegionStageData objects, but nothing seems to stick. Everything else is great thanks! Even after redownloading the dll I get this error. Does anyone know a solution for this? Hi, is there a prerequisite to add skillpoint ? The editor is working but when i want to add like 5 skill points the do save but when i launch my save and play, the points aren’t there. Sorry that near end of year but just really got bl2 on pc and found this. How to actually use github to download/use zip or anything to actually use? You want “saveedit-1.x.x.zip” (in this case, current version is “saveedit-1.0.5.zip”). Can somebody please tell me which file to download, because it’s not clear what is what. Many thanks Rick & happy new year. “Download latest release from GitHub.” in the post. I’m running into a problem where my overpowered stat keeps changing back to 0 after I save it as 8. Is there something I’m doing wrong or is this a glitch? I am looking throug h these comments and seeing people having the same issue with the “reencode Mismatch” and I have tried the fixes you have mentioned but I still have the issue. I can create my own save file and give that whatever I want and then use it but after I save and quit the game to edit it some more, I get the error message. I do not know how to fix this. I have the latest release, I have completely removed the editor and reinstalled it and that didn’t work. I have my Borderlands 2 on pc updated to the most recent patch and I still get the error. 99% of times I’ve looked into sample save files with reencode mismatch issues, it turns out people were using an old version of the save editor. If you’re absolutely sure you have the latest version and are using it, post a link to a sample of your decrypted save file. There is the link to the save Ive used the most. I was able to create the save, but now I cannot edit it more. Loads fine in the latest editor. You are not using the latest. I moved the editor to a different table and I can edit everything now. i keep running into an issue where i try to load my ps3 save and it causes the program to stop working and close. im using 1.0.3 and bruteforce save data editor. any ideas? I see that support for the nVidia Shield. Does anyone have insight as to where the game save files are located? I’m struggling using Xplorer on the Shieldtv to locate any games saves. Got it all figured out. Will post an update later. The ShieldTV HAS to be rooted to access the save files. They are in a subfolder in /data/data. I was able to retrieve the save and did a few small modifications and sent it back to the ShieldTV. Everything works! I’m new to BL2 data, do you have any advice on how to get the raw parts / stats data e.g. what was used behind the Gear Calculator? The one thing I’m missing in the Save Editor is I can’t view stats from BL2 codes or part combos…but the gear calculator website never got updated for L50+. Thanks! I am confused here, I open the save, but I don’t see my current character in game. what is the current latest version of gibbed? https://www.savewizard.net new Ps4 save editor….. has anyone checked this out yet???????? Hello. I am looking to get in touch with Gibbed. The creator. My name is xXTheDevilsSonXx, and I run a company called wolvesdeninc. (c) 2018. I was looking to discuss a few things. Please shoot me an email, and contact information. Thank you. 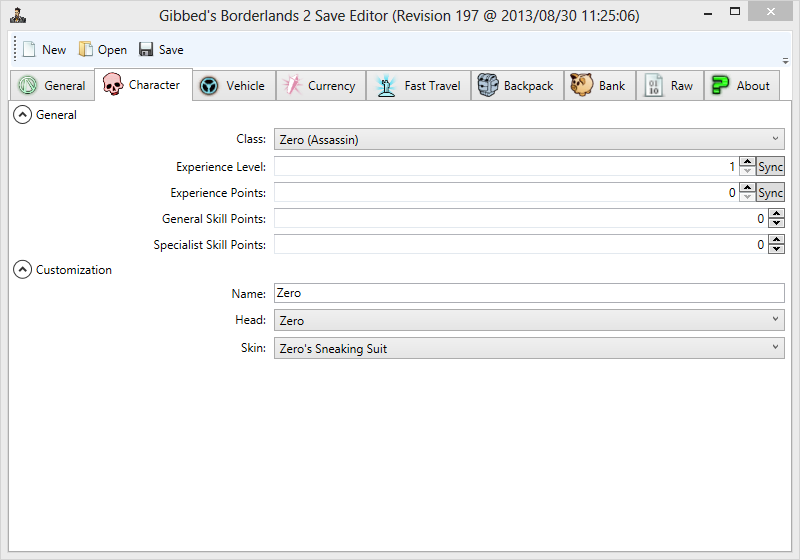 So, now that Borderlands 2 Handsome Collection is supported on SAve Wizard and it is allowed to use Advanced Mode on it, will you be looking into getting this save editor the ability to support the PS4 .sav file? Please let me know. The samples of saves I’ve received have been in the raw save format that I won’t support in my editor. If you want support you need to ask the Save Wizard people to provide the original save data after decrypting only the PS4 decryption. So the .sav file that I can export from the PS4 save date in the Save Wizard’s advanced mode isn’t the one you need?! This is the same .sav that I could hex edit if need be and import back into the PS4 save. Yes, they remove the game-specific compression/wrapper around the save. That’s required for my save editor to function. okay so im using horizon to extract the savegame.sav file, and every time I try opening it in gibbed, it keeps telling me “Failure to load save; Invalid or unsupported version”. now im no noob at using save editors etc, why is this happening??? I have the 1.05 version of gibbed or whatever its called (most recent version) so I don’t understand. does it require me to own all DLC in the game? if so which ones. thanks in advance. im just trying to edit my damn eridium lol! The error that I get is for Version 256; Also I gave it full admin rights, allowed through firewall as well, on a side note I even tried the Windows compatibility mode 7 and 8 with no luck at all. are skillfully tried by private organizations. I won’t be adding support for this because they are unwrapping the save format. Ask the Save Wizard people to allow you to export the original decrypted save and import it. A PlayStation 4 version is available?